A luxurious sleep at the Relais & Châteaux La Grande Maison in Bordeaux, France. And whether this is at the colourful budget hotel, Mama Shelter, or the opulent five-star La Grande Maison, you’ll wake up ready to tackle more croissants. Words Susan Gough Henly. The five-star Relais & Châteaux La Grande Maison is set in an 18th-century mansion. Each of the hotel’s six extravagant Napoleonic-style suites is named after one of owner Bernard Magrez’s 40 wine estates. Just 20 minutes from the five-star Les Sources De Caudalie is an exquisite country retreat. Enjoy its famous vinotherapy spa treatments and indoor and outdoor pools, and dine at La Grand’Vigne, Bordeaux’s only two Michelin-starred restaurant. Located in a converted mansion not far from the Place Gambetta, Yndo Hotel has 10 unique rooms and two suites, each of which features original art and the work of a different designer from the subtle neutral tones of Damien Langlois-Meurinne to the bright mischievous designs of Brazilian artists, the Campana brothers. 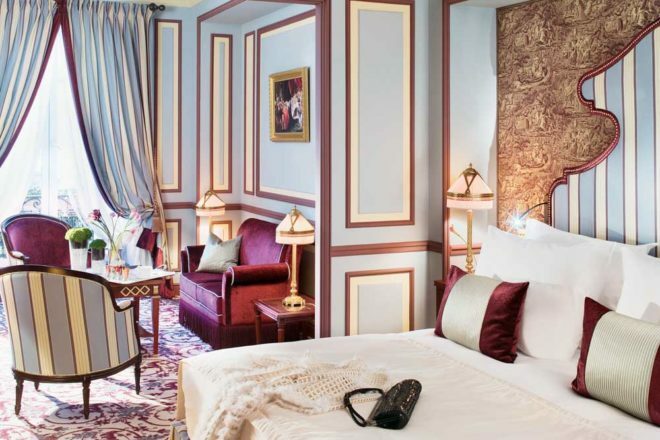 The four-star Boutique Hôtel Bordeaux tucks two apartments and 25 personality-filled rooms with spacious bathrooms into an 18th-century townhouse. There is a cosy wine bar as well as an atrium and garden terrace, perfect for a sunny breakfast. A highlight is the sommelier-led blind tasting tour around the wines of France accompanied by tapas. The bright and boisterous Philippe Starck-designed budget hotel Mama Shelter is a clever revamping of a utilitarian government building in the heart of the Old Quarter with a great rooftop bar.